a structure of bowlike or curved outline. abdominothoracic arch the lower boundary of the front of the thorax. arch of aorta (aortic arch) the curving portion between the ascending aorta and the descending aorta, giving rise to the brachiocephalic trunk, the left common carotid artery, and the left subclavian artery. aortic a's paired vessels arching from the ventral to the dorsal aorta through the branchial clefts of fishes and amniote embryos. In mammalian development, arch 1 largely disappears but may contribute to the maxillary and external carotid arteries; the dorsal portion of arch 2 persists and forms stems of the stapedial arteries; arch 3 joins the common to the internal carotid artery; arch 4 becomes the arch of the aorta and joins the aorta and subclavian artery; arch 5 disappears; and arch 6 forms the pulmonary arteries and, until birth, the ductus arteriosus. four pairs of arched columns in the neck region of some aquatic vertebrates that bear the gills. Branchial arches. From Dorland's, 2000.
dental arch either of the curving structures formed by the crowns of the upper and lower teeth in their normal positions (or by the residual ridge after loss of the teeth); they are called the inferior dental arch (see mandibular arch) and the superior dental arch (see maxillary arch). a's of foot the longitudinal and transverse arches of the foot. The longitudinal arch comprises the medial arch or pars medialis, formed by the calcaneus, talus, and the navicular, cuneiform, and the first three tarsal bones; and the lateral arch or pars lateralis, formed by the calcaneus, the cuboid bone, and the lateral two metatarsal bones. The transverse arch comprises the navicular, cuneiform, cuboid, and five metatarsal bones. lingual arch a wire appliance that conforms to the lingual aspect of the dental arch, used to secure movement of the teeth in orthodontic work. 1. the first branchial arch, being the rudiment of the maxillary and mandibular regions; it also gives rise to the malleus and incus. 2. the dental arch formed by the teeth of the mandible; called also inferior dental arch. maxillary arch the dental arch formed by the teeth of the maxilla; called also superior dental arch. palatal arch the arch formed by the roof of the mouth from the teeth on one side to those on the other. pharyngeal a's structures in the neck region of the human embryo that are analagous to the branchial arches in lower vertebrates; the four pairs of pharyngeal arches are mesenchymal and later cartilaginous structures that develop during the first two months of embryonic life and are separated by clefts (the pharyngeal grooves). 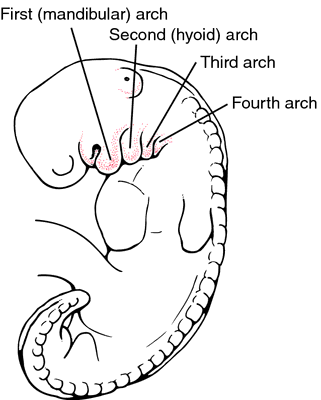 As the fetus develops, the arches grow to form structures within the head and neck. Two of them grow together and enclose the cervical sinus, a cavity in the neck. Called also branchial arches. pubic arch the arch formed by the conjoined rami of the ischium and pubis of the two sides of the body. pulmonary a's the most caudal of the aortic arches; it becomes the pulmonary artery. tendinous arch a linear thickening of fascia over some part of a muscle. vertebral arch the dorsal bony arch of a vertebra, composed of the laminae and pedicles of a vertebra. zygomatic arch the arch formed by the temporal process of the zygomatic bone and the zygomatic process of the temporal bone. See also anatomic Table of Bones in the Appendices. 1. The curved portion of the aorta between the ascending and descending portions that gives rise to the brachiocephalic trunk, the left carotid artery, and the left subclavian artery. 2. One of a series of paired arteries in a vertebrate embryo that connects the ventral arterial system to the dorsal arterial system. See arch of the aorta. 1. The curved portion of the aorta between its ascending and descending parts. 2. Any member of the several pairs of arterial channels encircling the embryonic pharynx in the mesenchyme of the branchial arches. one of a series (up to six) of paired arteries that join the ventral and dorsal aorta in vertebrates or their embryos. In fish the arches form the efferent and afferent branchial vessels, and in higher vertebrates the carotid, systemic and pulmonary arches. the curvature of the aorta where it turns from its cranial path to a caudal one and becomes the thoracic aorta. See also aortic. include persistent right aortic arch, double aortic arch, and anomalous arch arteries, which cause compression of areas of the respiratory or digestive tracts. differ between species; e.g. cat, dog, rabbit are the same; horses and cattle are the same; pigs have one pattern, chickens another. persistence of both right and left embryonic aortic arches creating a vascular ring anomaly that causes esophageal entrapment. persistence of the fourth right aortic arch causes constriction of the esophagus with regurgitation, aspiration pneumonia and dysphagia, and bloat in ruminants. The signs are present at birth. recorded rarely in horses; a fistula develops after simultaneous perforations occur in the pulmonary artery and the aorta resulting in the development of a fistula and the acute onset of heart failure which is usually fatal within a few days. Possibly results from an inherited defect in the vasa vasorum of the vessels. rare occurrence in horses resulting in acute cardiac tamponade or dissecting aneurysm into the myocardium and sudden death; is part of marfan's syndrome in calves; rarely a result of onchocerciasis in cattle. any of a group of disorders leading to occlusion of the arteries arising from the aortic arch; such occlusion may be caused by atherosclerosis, arterial embolism, etc. the change in the original pattern of aortic arches of the fetus as a result of degeneration of some vessels and differential enlargement of others (see Table 9).